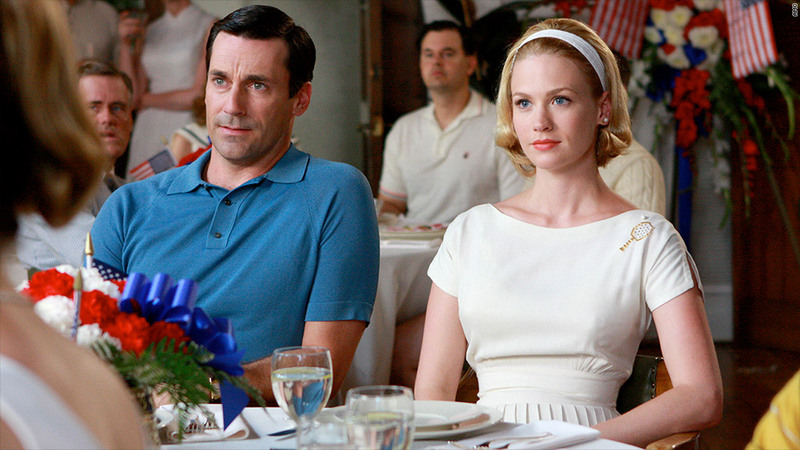 During the "Mad Men" era, married couples made up the majority of tax filers. But today -- thanks to demographics that include higher divorce rates -- singles file the most federal tax returns. Too bad taxes aren't romantic. If they were, April 15 would make for the world's biggest singles mixer. That's because single people, including heads of household as well those who are widowed or divorced, account for the majority of federal tax filers in the United States. In 2011, they filed 61% of all returns, according to an analysis of IRS data by the Tax Foundation. That's a big shift from the days when married couples accounted for more than 60% of the tax-filing population, back in the "Mad Men" era. The switch isn't surprising given how U.S. demographics have been shifting. People wait longer to get married, more people live together, divorce is common and single parenthood has gone up. Unmarried Americans who are 18 and older now comprise 44% of U.S. households, according to the latest Census data. And Americans who live alone accounted for 27% of all households in 2012, up from 17% in 1970. "When we think of middle class families, we think of married couples with children such as June and Ward Cleaver. ... [But] the typical taxpayer looks more like Phoebe and Joey from 'Friends,'" the Tax Foundation notes in a report. And that can mean some tax policies intended to help middle-income taxpayers may miss the mark. When it comes to dollars paid, however, those who are married filing jointly still pay more as a group than their single compatriots. Single filers paid about $284 billion in income tax in 2011 -- or 27% of the total collected that year, according to the Tax Foundation analysis. Those who were married, meanwhile, ponied up nearly $761 billion, or 73%. That may be due in part to the fact that there are now far more dual-earner couples than in the past. Today roughly 75% of households making more than $200,000 have two or more workers, according to the Tax Foundation.